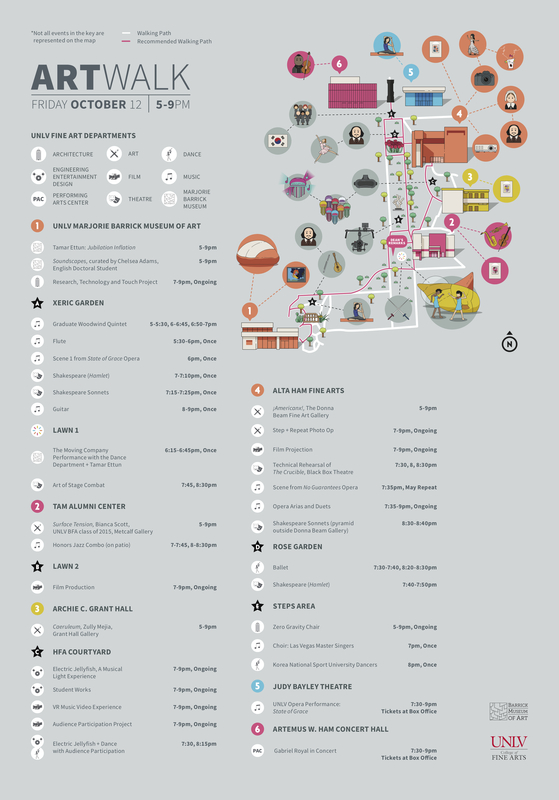 Visit the link below for a complete Art Walk map and schedule of events. UNLV College of Fine Arts Dean Nancy J. Uscher invites you to a celebratory evening honoring the Las Vegas arts community for its dedicated support of the arts and culture in Southern Nevada from 5 p.m. to 9 p.m Friday, Oct. 12, 2018. 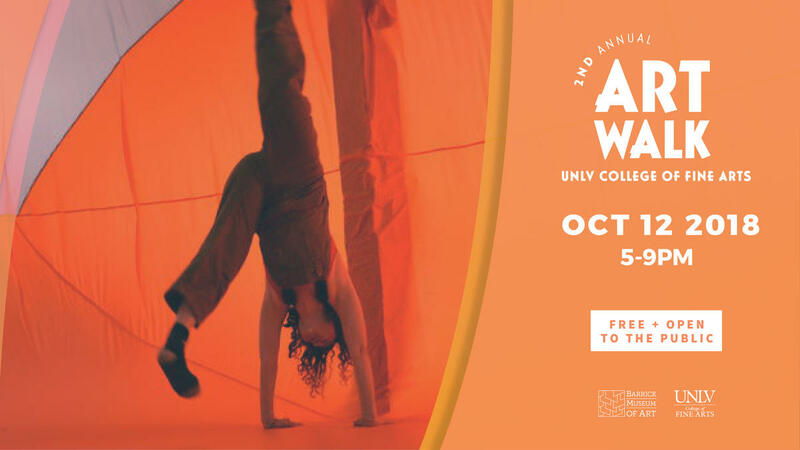 Beginning in the Marjorie Barrick Museum of Art, and winding its way through campus grounds and gardens, the Art Walk will introduce you to all seven areas of the Fine Arts at UNLV — Dance, Film, Theatre, Architecture, Music, Art, and Entertainment Engineering and Design. Engage with interactive film sets, be awed by the power of a ninety-person choir, savor a performance of Shakespeare’s sonnets, and much more. Champagne, wine, and hors d’oeuvres will be served. It is free and open to the public. Tamar Ettun's Jubilation Inflation: Jubilation Inflation unifies different areas of the Tamar Ettun's practice in a multifaceted examination of trauma, healing, and radical empathy. This solo exhibition consists of several parts. At the center, there is an intimate compartment containing an installation of interactive audio work. It is surrounded by mixed media sculptures, a selection of experimental videos, and four inflatable room-sized environments where visitors will be enveloped by a climate of vivid color. Soundscapes: Exploring Anthropophony: Soundscapes explores the sounds we use — both deliberately and unconsciously — to connect ourselves to the people around us. From Mesoamerican clay whistles to work by contemporary artists such as Charles Clough, this group exhibition roams through history to ask us how people have created sound in the past and how we experience sound now. Curated by Chelsea Adams, UNLV English Doctoral Student. Curated through the Donna Beam Gallery, ¡Americanx! assembles a lively group of artists whose artwork runs the gamut of inspirational sources and cultural commentary with varied media, from painters to sculptors, photographers, illustrators, cartoonists, and installation. “¡Americanx!” has UNLV introducing the depth and diversity of contemporary works produced by artists of Latino/a/x heritage who call Las Vegas home. Performance by Yasmina Chavez and Javier Sanchez: 7:45 pm - 8:00 pm. 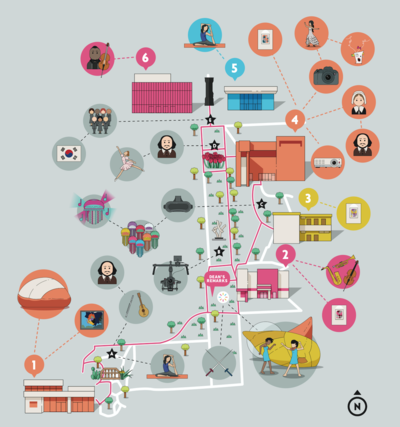 The Art Walk will introduce you to all seven areas of the Fine Arts at UNLV — Dance, Film, Theatre, Architecture, Music, Art, and Entertainment Engineering and Design. State of Grace, The UNLV Opera Theater proudly presents the world premiere of State of Grace, a new opera by soprano Linda Lister, who also directs the UNLV Opera Program. Gabriel Royal: Singer-songwriter and cellist, Gabriel Royal, plays his “grown-up lullabies” in New York’s subways, where he connects to his inspiration: New York’s commuters. You can hear his jazzy, poppy brand of crossover right here in Las Vegas. The College of Fine Arts and the Marjorie Barrick Museum of Art appreciate our generous supporters. Refreshments for the Art Walk are courtesy Alexxa's, Eclipse Theaters, Epicurean Society, Full House BBQ, Hexx, Jean-Marie Auboine Chocolates, Pepsi, Savory Thyme, Southern Glazer's Wine and Spirits, and The Westin. Jubilation Inflation is funded in part by a grant from the Nevada Arts Council, a state agency, and the National Endowment for the Arts, a federal agency. Our artists are grateful for the support from The Cosmopolitan of Las Vegas. 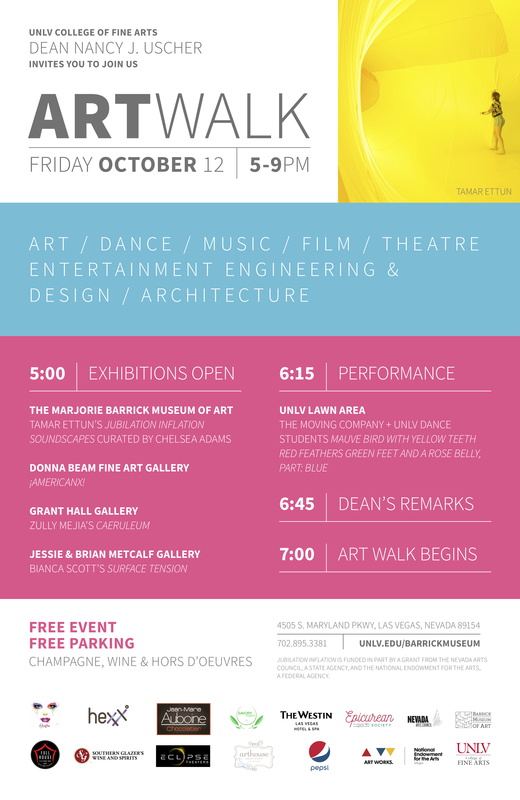 Thank you to ArtHouse Design for creating a beautiful invite for the Art Walk, and special thanks to UNLV Facilities and Grounds for the ongoing support.